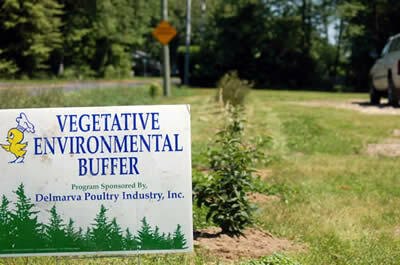 Vegetative Environmental Buffers | Delmarva Poultry Industry, Inc. The Delmarva Poultry Industry, Inc. (DPI) Vegetative Environmental Buffers Program began a few years ago to help with air quality improvements on chicken farms in Delaware, the Eastern Shore of Maryland, and the Eastern Shore of Virginia. DPI assumed responsibility for the program in 2006 after its creation by the University of Delaware. 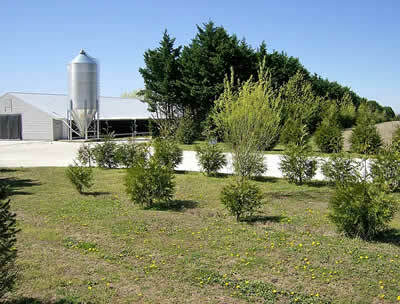 The planting of trees around chicken houses has both air quality and water quality benefits. Properly designed vegetative environmental buffers with farm-specific plants -- trees, shrubs and warm season grasses -- help capture air emissions from chicken houses. Additionally, these vegetative environmental buffers can absorb nutrients in the soil and water around chicken houses and help prevent the movement of nutrients to adjacent waters. Vegetative environmental buffers also let growers reduce the time and expense of mowing grass. And DPI is also pioneering the adaption of pollinator-friendly vegetative environmental buffers, which promote crop pollination on top of their other advantages. In 2017, DPI was awarded a grant from Bayer's Feed A Bee program to help growers on Delmarva plant pollinator-friendly vegetative environmental buffers. Since 2006, the DPI Vegetative Environmental Buffers Coordinator has worked with hundreds of growers and overseen the designs of vegetative environmental buffers, helped growers navigate the systems of cost-share programs, and identified contractors to help with the plantings. Delmarva chicken growers can contact program coordinator Jim Passwaters to learn more about this internationally known environmental program.